My first experience with organ donation occurred in 2007 when my husband, Julian, was diagnosed with liver failure and was put on the transplant waiting list. He had several close calls during the wait, coming close to death a couple of times, but after 16 long months, he got The Call that a liver was available for him at last. After his transplant, he was able to go back to work and living the normal life he use to have. We were so thankful for this second chance. 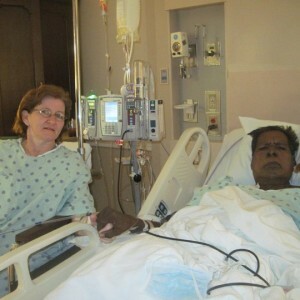 However, in December of 2009, his kidneys began to fail and he started dialysis. When the doctor told us he would ultimately need a transplant, I announced “I am going to donate a kidney to my husband!” The doctor was surprised but ordered all the tests. The process took a long time, but we tried to be patient. I prayed that God would allow me to donate, or to help me accept it if I couldn’t. Either way, were we in it together and I would be by his side. In May 2010, we got the surprising news that I was a 5 out of 6 antigen match. Several weeks later on July 25, 2010, we both went into surgery with our family by our side. We made the most of that time together, but he passed away on November 1 that same year. I am so grateful that I was able to give Julian the Gift of Life and I would do it all over again. Now, I volunteer at the same hospital where I was a donor. I share my story and encourage others to keep the hope while patiently waiting on a transplant. I make tie blankets and pass them out to transplant patients and family members in Transplant Center waiting rooms. It’s my way of letting them know I have been where they are and that I care. I joined Team Texas to participate in the the 2012 Transplant Games in Grand Rapids and the 2014 Games in Houston. This year, I am looking forward to the 2016 Games in Cleveland and hope my story as a Living Donor continues to show my support for all those who have been given the Gift of Life and gives hope to all those who are still waiting for their second chance.